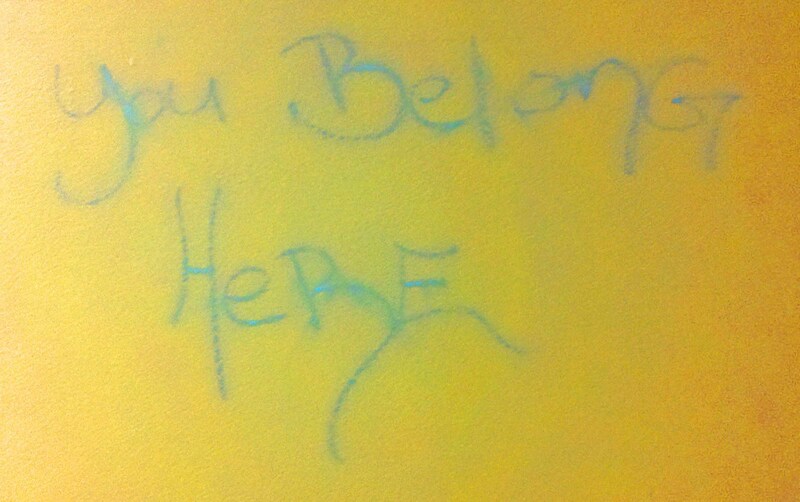 This was written on the wall in the hall outside of the space where the Art Street Deli now resides on the 2nd floor of Emergency Arts, circa October 2012. At that time, very few people were privy to this photo for two reasons: 1) What if my business-creating plans failed miserably before they even got off the ground? Sound the flake alarm! 2) My giddiness almost indicated a personal belief in fate, and everyone knows that’s not self-respecting-atheist-approved behavior. I still don’t know who wrote it, but I can tell you that the day I took this photo with my ailing DROID X was the day I called Jennifer (my lovely landlady) and heard her say she might have a space that would work for me. After skipping over random potholes like an 8-bit ninja, Feetish Spa Parlor was partially crowdfunded, built, and continues to prosper in this community of belonging. So whether you’re a little bit odd or abnormally creative, and you’re eager to learn, grow and evolve while being surrounded by other fun-loving doers, know that you, too, belong here. This entry was posted in Downtown Las Vegas, Feetish Spa Parlor and tagged belonging, downtown las vegas, emergency arts by feetishspa. Bookmark the permalink.